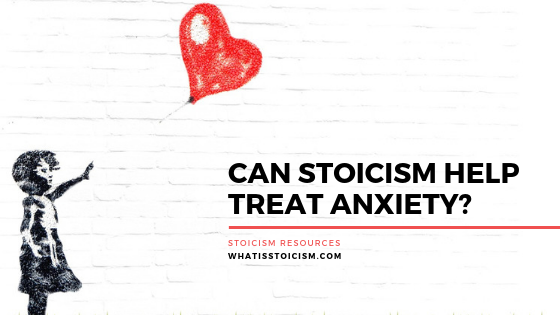 Can Stoicism Help Treat Anxiety? - What Is Stoicism? In his book Reasons To Stay Alive, Matt Haig says anxiety can be a “full-time occupation of gale-force worry”. From personal experience, this rings true. It can occupy days and weeks with fear, and then leave you regretting the time you wasted. You dread the future and then get caught in the past. The cliched remedy for this is apparently to “live in the moment,” but what does that even mean? To help us stay in the moment, the Stoics recommended certain attitudes towards the past and future. We should learn from the past but ultimately let it go, and we should periodically consider the bad things that can happen in the future in order to either prevent them or soften the blow if they occur. It sounds flippant to suggest that if we just “let go” of the past it will never cross our minds again, but the advice can help if we rationalise it a bit more. As Matt Haig advises, “Accept. Don’t fight things, feel them. Tension is about opposition, relaxation is about letting go.” The Latin phrase Amor Fati conveys this sentiment in a even stronger manner, promoting not just the acceptance, but the love, of one’s fate. If being fatalistic in relation to the past is difficult, considering future problems is certainly easier. Too easy perhaps for someone with anxiety. The Stoics called it premeditatio malorum – the premeditation of evils. Maybe formalising, even scheduling, our future worries in this way gives us a sense that they’re being dealt with and will ease the negative self-chatter that sparks up at inconvenient times. If these attitudes help us deal with the past and the future, what about the present? How do we minimise the impact of anxiety right now? I think it’s by taking a step. One step today, another one tomorrow, and so on. Where do the steps lead? Towards something you’re anxious about doing. One step is fortification for a future attempt at doing that thing, and however slight the related reduction of anxiety is, it’s still a reduction. What one step forward can you take today? In Walter Isaacson’s biography of Leonardo da Vinci, he describes the painter’s use of a technique called chiaroscuro. “From the Italian for light/dark, [chiaroscuro] is the use of contrasts of light and shadow… for achieving three-dimensional volume in a two-dimensional drawing or painting.” To me, this feels like an apt metaphor for life, and encouragement for taking those first steps; to fully appreciate the good times we often need to endure bad times – the light and dark. Although resilience and self-care are important, that isn’t to say we shouldn’t seek help from others when needed, and it’s interesting that a common anxiety treatment is fundamentally similar to Stoicism in its approach. Cognitive Behavioural Therapy (CBT) is a talking therapy that looks at things like logic, acceptance and control to manage problems by changing the way someone thinks. These principles draw greatly from the teachings of Epictetus, who spread the idea that our thoughts about events have a greater impact on us than the events themselves. Couple that with his assertion that we should only concern ourselves with things which are within our control, and we have two very powerful attitudes to help us in coping with anxiety. CBT seeks to improve our ability to distinguish between the things we can and can’t control, and thereby make it easier to accept our circumstances and love our fate. For those interested to learn more, The Philosophy of CBT by psychotherapist Donald Robertson details how much CBT owes its philosophical origins to the Stoics. I will give the final word to Leonardo. Like him, we have the option (if not always the voluntary ability) to see things as we wish. The option to interpret events positively and not have our thoughts about events harm us more than the events themselves.